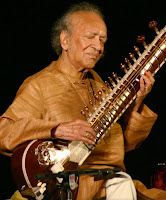 Steve Cameron: Science Fiction & Fantasy Author: Vale: Ravi Shankar. I first heard Ravi Shankar as a teen, when a friend gave me a tape of The Concert For Bangladesh. After that initial playing I tended to skip the first part as I didn't 'get' Indian music. Later, of course, I recognised Shankar for the genius he was, and quite enjoyed listening to his work. His influence on The Beatles, and George Harrison in particular, is enormous. Although Harrison had first become interested in the sitar during the filming of Help!, it was 1966 before he met Shankar and travelled to India to study with him. As a musician, a teacher and a lecturer, Shankar toured the world and taught at a number of universities. His work brought international recognition to the music of his homeland. He died in California at the age of 82.